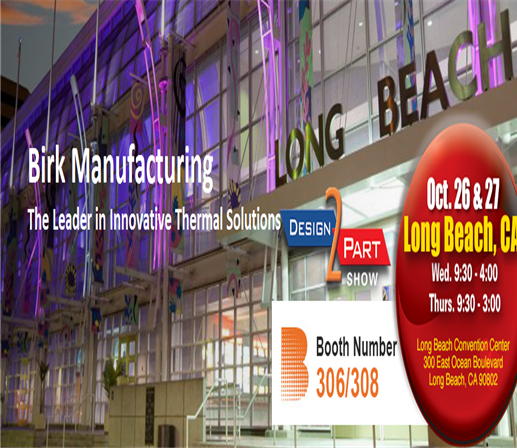 Thermal solution products manufacturer Birk Manufacturing Inc. will be participating as an exhibitor in the Design-2-Part Show on October 26th and 27th, 2016. The event will be taking place at Long Beach Convention Center, 300 East Ocean Boulevard, Long Beach, CA. Birk Mfg. will be available at booths 306 & 308. The Birk Mfg. team will be showcasing its various products, services, and their respective benefits. The team will also be giving a preview of one of Birk’s upcoming, in-house, control box product line. The preview will allow Birk representatives to gauge the responses of engineers and guests regarding the product’s design and function. The representatives will also be taking the opportunity to answer queries of attendees. This focus on customers will help Birk Mfg. in understanding the current needs of customers, as well as industry requirements. It will also put Birk in a better position to provide custom services. “At Birk, we understand that our products and services need to evolve according to the needs of the market,” says Rebecca Mattox, Sales and Marketing Manager, Birk Manufacturing, Inc. She elaborates, “Instead of trying to convince customers to avail standard product designs, we focus on creating custom solutions that will support their applications”. With over three decades of experience in manufacturing flexible heating elements, Birk continues to live up to its mission of providing products of immense quality and services on par with international standards. Birk Manufacturing Inc. is a leading manufacturer of thermal systems and flexible heaters of high quality. The products are sought after for use in medical devices, diagnostic machines, and semiconductor and instrumentation equipment. The organization’s design and manufacturing processes are performed completely in-house, and Birk offers quick turnaround times on new designs. Birk’s products, as well as design and manufacturing solutions comply with ISO 9001:2008, ISO 13485:2003 and AS9100:2009C, UL, CSA and ITAR standards.